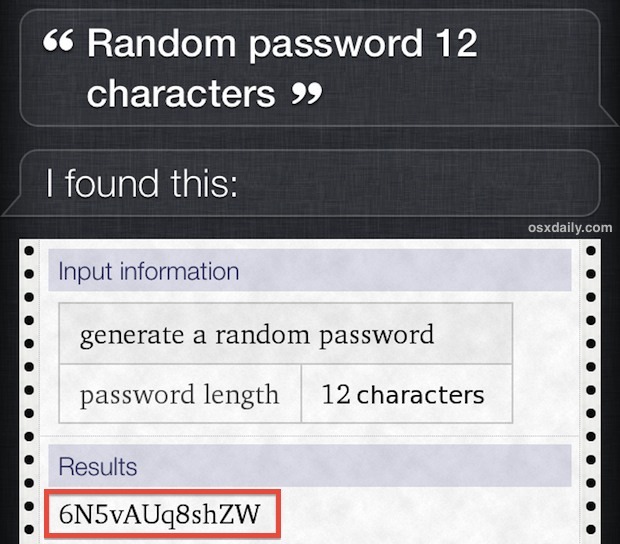 The next time you need a new randomly generated strong password, pull out an iPhone and ask Siri. Yes, the voice assistant that lives in iOS. You won’t find this trick in Siri’s own listing of commands list, but it’s a piece of cake to use and quite powerful. There are tons of examples where this is useful, but many will find this particularly helpful when you are at a machine without access to Keychain’s generation tool or even command line access, especially if you didn’t memorize or alias the proper command syntax to randomly generate one in the first place. Plus let’s face it, in many situations it’s just easier to ask Siri than it is to launch another app anyway. You’ll find the response is an alphanumeric mixed cap of 8 characters, which while ok for many uses, the length is not ideal for many real world situations. For added security you can increase both complexity and overall strength simply by increasing the character length of the generated pass code. Siri is wise enough to not vocalize the password that has been created, preventing any nearby individuals from hearing the results, and thus keeping them even more secure and usable. And it’s also smart enough to offer the results in an easily speakable format if you need to relay the generated complex password to someone else over the phone (like saying Alpha Bravo for AB, to prevent misunderstandings and mismatches). All of these passwords are truly random, you can confirm this by asking Siri the same ‘random password’ question over and over again and you will always get different results coming back to you. This is because Siri is getting the generated passwords from WolframAlpha, and the further you scroll down in the Siri results the more information you will see regarding the initial query you gave. Siri will even tell you how long the password would take to enumerate, which in more hackerish terms means how long the generated password would take to crack. 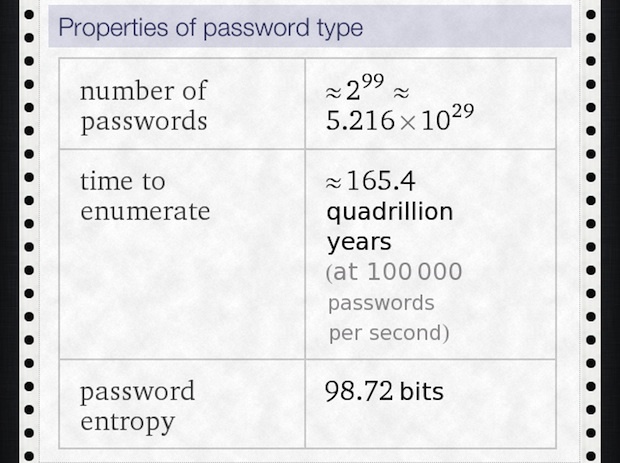 In the case of a 16 character randomly generated variation, it would take 165.4 quadrillion years at 100,000 passwords guessed per second, which is obviously a pretty good timeline for any earthly species. Thanks to Peter for sending in this great trick! this doesn’t work in os 7.1? 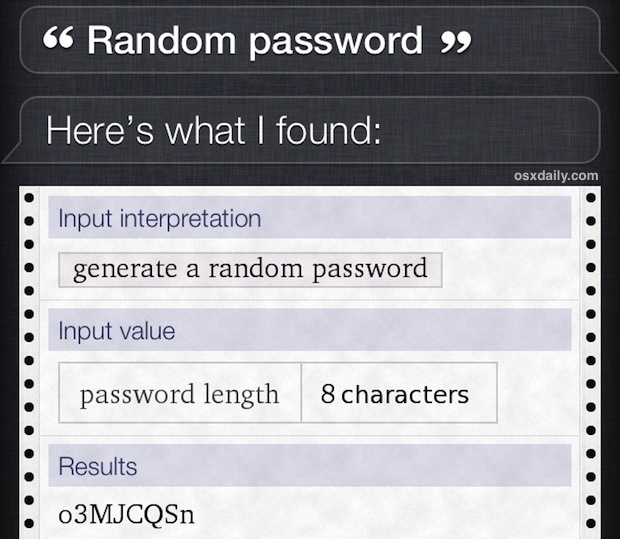 The password generation comes from Wolfram Alpha, so yes it works with every version of iOS that has Siri. 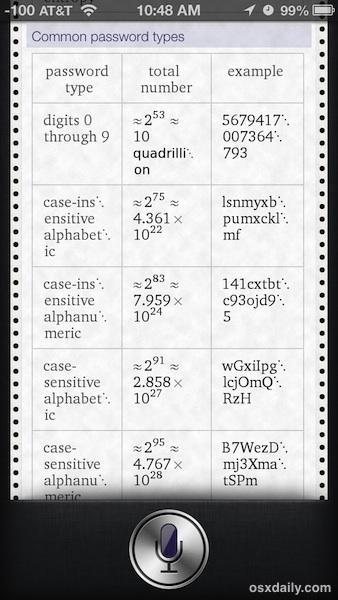 iOS 7, iOS 8, iOS 9, iOS X, you’ve got Wolfram Alpha until you don’t. Does Not Work. Wolfram Alpha is even installed on my iPhone 5s. Siri kicks back a list of websites, as the answer to “Random Password 16 Characters” ….Is there a setting that Forces Siri, to use Wolfram Alpha, Instead of searching the web? Well, doesn’t work for me either. Read it exactly verbatim numerous times. So…either we’re too stupid to read a line of text into Siri, or the “feature” is buggy and doesn’t always work. Decide which of your own accord. That is Exactly what I was saying but Malotiki wishes to be a real prick about it, …and make it real clear to All. Does Not Work or me. Wolfram Alpha is even installed on my iPhone 5s. Siri kicks back a list of websites, as the answer to EXACTTLY STATING >>>>>>“Random Password 16 Characters”<<<< ….Is there a setting that Forces Siri, to use Wolfram Alpha, Instead of searching the web? You can say “Wolfram Alpha random password 12 characters” and Siri will give you the answer, which comes from Wolfram Alpha. I’m guessing that when Siri switched to Bing as the default search engine, the direct recognition of this phrase stopped working.